As the years pass, the Lake Michigan ecosystem continues to evolve. Some of the changes made have been predicted by biologists, while others have caught them by surprise. Let’s try to make a little sense of the past, before we look to the future. Salmon were introduced in Lake Michigan via the Platte River by Dr. Howard Tanner in 1966. Decades of aggressive commercial fishing coupled with a wave of introductions of invasive species left Lake Michigan in turmoil. The Lake Trout was once the apex predator, but was forced down the line by the invasions of the Sea Lamprey and the Alewife. The latter, became the most prevalent species in Lake Michigan during the middle of the 20th century, making up a large percentage of the total biomass in the lake. 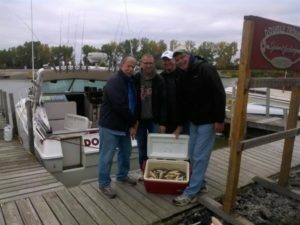 Dr. Tanner’s plan was simple: to use the abundant Alewife population as the primary forage base for a population of Pacific Salmon and in turn create a world class fishery across the state of Michigan. No one new if the idea would work, but just 18 months later mature Coho Salmon flooded the nearshore waters of Lake Michigan near Platte Bay. In the years that followed Chinook Salmon were introduced and the Great Lakes Salmon program was up and running. Since that time, the lake has never stopped evolving, and in turn keeping fisheries managers on their toes. One of the biggest surprises in the first quarter century of the salmon stocking program was the amazing reproductive ability of the Chinook Salmon beginning around 1990. Due to this, the stocking of King Salmon has been cut several times over the last 16 years to try to keep a balance between the predator and prey in the lake. To make matters more difficult invasive Zebra and Quagga Mussels have put additional pressure on the prey base by consuming valuable nutrients on the bottom of the food chain. Which brings us to the conundrum: how do we find a balance between the Chinook and their prey in Lake Michigan? And in the interim, what should we expect the fishing to be like in 2015? The short answer to both of those questions is simply nobody knows. There are good signs from the fishery but also some not so good signs. On the negative side catch rates of Chinook have decreased during the last 2 seasons lake wide from the peak in 2012. The 2012 season saw catch rates set records across Lake Michigan, while 2013 and 2014 saw steady declines from that peak (although 2014 did see a modest increase over 2013). Also Alewife numbers have been in a decline for some time, there have been a few good hatches recently but several busts as well. In order to sustain a productive salmon fishery a solid crop of Alewife is necessary, the 2010 hatch was a boom, while the 2011 and 2012 hatches were fair to moderate. The 2013 hatch was a bust, while the jury is still out on the 2014 hatch. Despite these, there are a few positive signs that have surfaced the last few seasons. First off, the average size of returning 3 year old Kings has increased sporadically since 2007. There is also evidence that the nutrient robbing Quagga Mussels are not thriving as well as biologists suspected in the moderate to deep areas of Lake Michigan. Finally the natural reproduction of King Salmon in Lake Michigan has seemed to vary widely in recent seasons, possibly pointing to the two species attempting to find a balance within the ecosystem (this is the opposite of what happened on Lake Huron during 2004, as Alewife stocks plummeted natural Chinook reproduction was increasing). As we enter the spring months, many anglers don’t know what to expect during the coming season. The overwhelming good news is that fishing has already been very productive across the southern portion of Lake Michigan this spring. Coho salmon have been taken in great numbers along with King Salmon of all age classes. 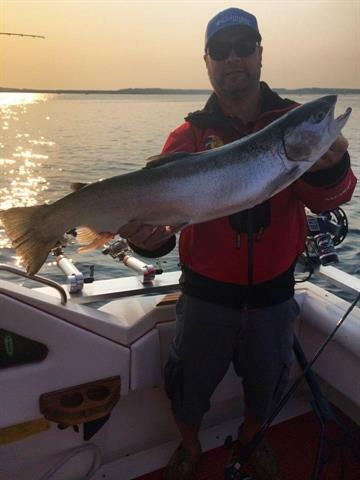 Some of the mature king salmon have been very healthy and approaching the 20 pound range. The warm spring temperatures we are experiencing should certainly help concentrate fish not only early in the year but also later in the season as well. 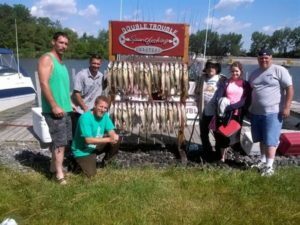 Despite the good news anglers should be wary to expect fishing like the 2012 season provided during the coming year. Those who keep their options open will be the most likely to be successful on the big water in 2015. Remember on days when the King Salmon aren’t jumping in the boat, that they aren’t the only fish in the lake. Whether that means fishing the offshore water for Steelhead and Coho Salmon, or fishing the nearshore structure for Lake Trout, keeping an open mind is more imperative to success than ever before. Overall we are expecting a productive fishing season on Lake Michigan during 2015. No matter what port you are fishing during the coming season we hope this season brings you calm seas and heavy coolers. We’ll see you on the water.